The maniacs at 21st Street Games (the same maniacs that created Techno Kitten Adventure) have a new game coming: The Tossing Dead. For the 2012 WeKillYou solo show in Los Angeles titled "A Cry For Help In A World Gone Mad", this first collaborative figure was created. 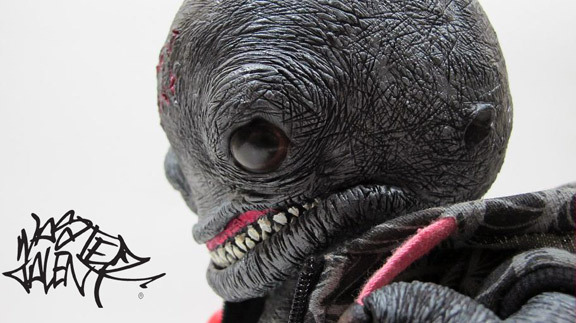 The figure was hand made and pained by We Kill You and designed by CBNC, a lifestyle brand based out of Los Angeles California. This figure is one of a kind, hand cast and painted resin collectable by WKY and includes: Chubbs figure, CBNC logo helmet & Skateboard. Several colorways are available here. Chubb CNBC edition available here (limited to 10 pieces). WKY & CBNC from The Sleepers on Vimeo. This sweet little fella is a lonesome wanderer of the forest. Tootles likes leaving little gifts on the doorsteps of his neighbours made from leaves and flowers much to the bemusement of his bloodthirsty, war-loving fellow tribe members. He spends most of his time with the animals and insects of the woodland in particular the bees who happily share their honey with this strange little boy. Buy Tootles here in the Lunabee shop. 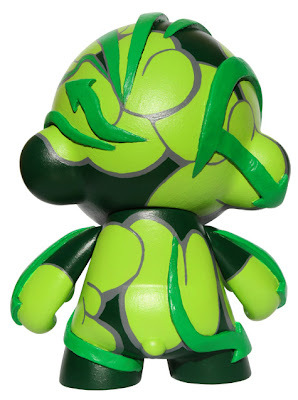 8-inch Custom Manotaur - Greeny. 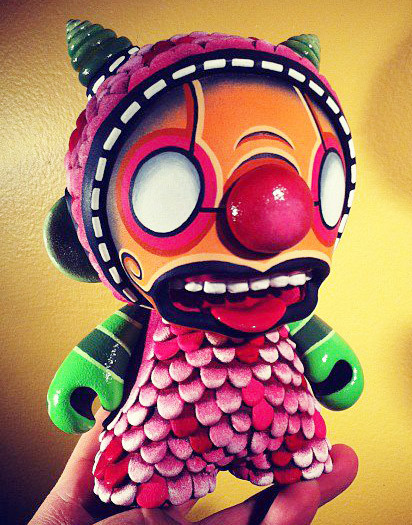 Design and sculpt by Justin Hillgrove. 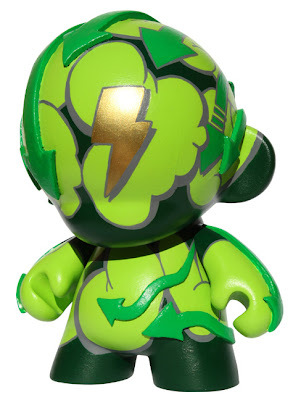 Paint by Rampage Toys. Sweet Manotaurs, Ugly Unicorns, Zhou-chan, Satou-chan and Cuppies available in the Rampage Toys shop, which seems to be growing by the minute! Such awesome, brightly-colored toys available! Custom Ugly Unicorns from Studio Uamou Exhibition: mixed parts, vinyl with stenciling and brushwork, matching Satou-chan (vintage sofubi)! 8-inch Custom Manotaur - Shiny. Design and sculpt by Justin Hillgrove. Paint by Rampage Toys. 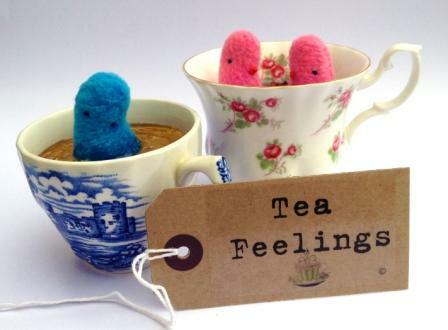 Penny Taylor of Taylored Curiosities shares with us Tea Feelings: combining plush, resin and vintage teacups to create these little creatures, bathing in tea, that have similar scents to their full plush counterparts. 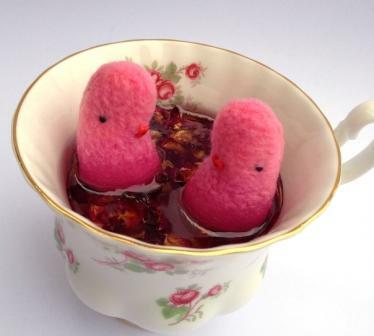 Each 'tea' is a mixture of clear resin, layered with natural additives like rose petals, orange slices or lavender buds and then depending on the size of the teacup, one, two or maybe even three little creatures sit inside. These are different from my usual work as they are collectibles and each one will be one of a kind as I treasure hunt for reject teacups that no longer belong to full sets. The idea is that each type of 'tea' approaches a different aspect of life i.e. 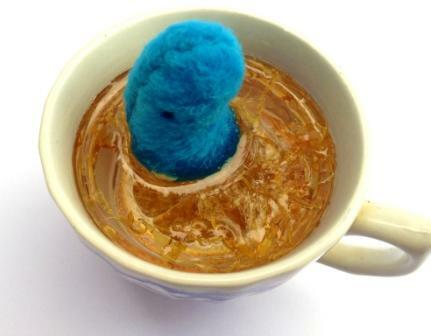 Tired tea has an orange scent which can help you feel more energetic and Love tea has a rose scent which makes you feel uplifted (the same as my Aromaterapy Plush). What do you do when you have a problem? Pop the kettle on and chat it out. 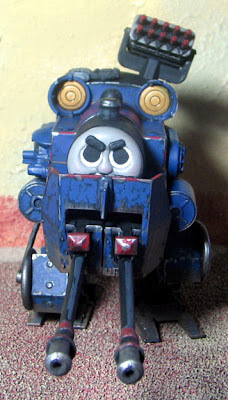 These are based on a similar idea. Those who follow my work, know how much of an over qualified tea drinker I am and these combine all the aspects that make my work 'me'. Artist Bryan A. Collins sends word that he will be appearing at Pioneer Days in High Springs, FL on April 28th & 29th, selling original art at his booth. Meet the guy and buy some art! I've met Bryan here in the NYC area when he last visited- he's a great guy that I am happy to call a friend. 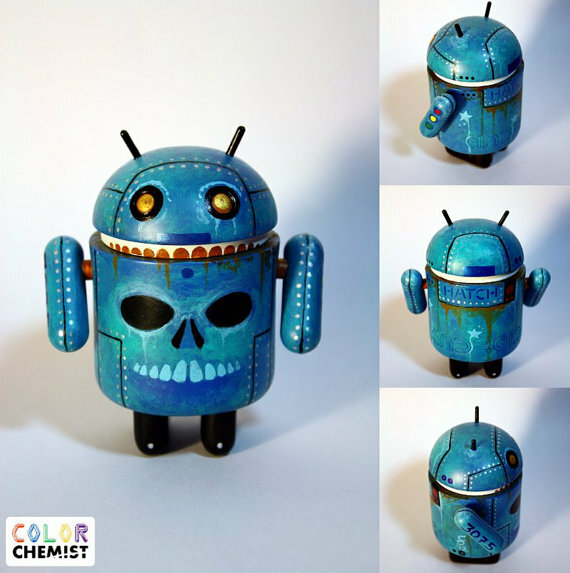 You can also order a commissioned Android (like the one you see above) from Bryan by going here, and check out the custom toy section he put up on his Etsy page to see the other figures he's offering. 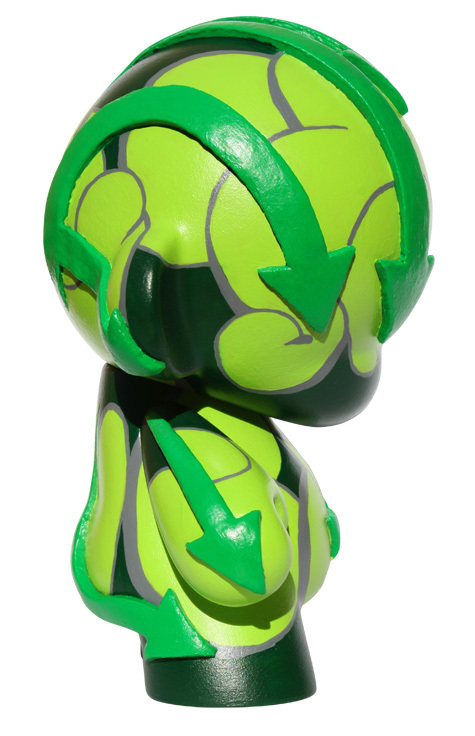 South African artist Abe Viljoen (aka The Given) sends us images of his 7" Munny entitled “Acid Flow”. Abe writes: This piece started out as some fun for myself, getting back to my roots in graffiti and letting it come out more heavily in my vinyl work. 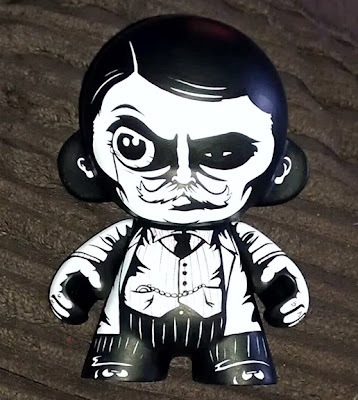 I was quite happy to be creating a toy with only myself to please, but I must admit I was even happier when it ended up selling before it was even finished! 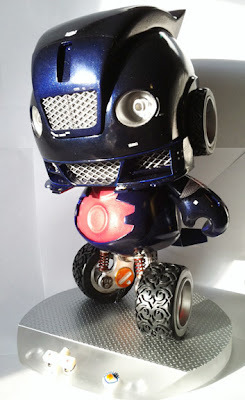 The toy was officially unveiled at the Toffie Pop Festival here in Cape Town on the 31/03/12. 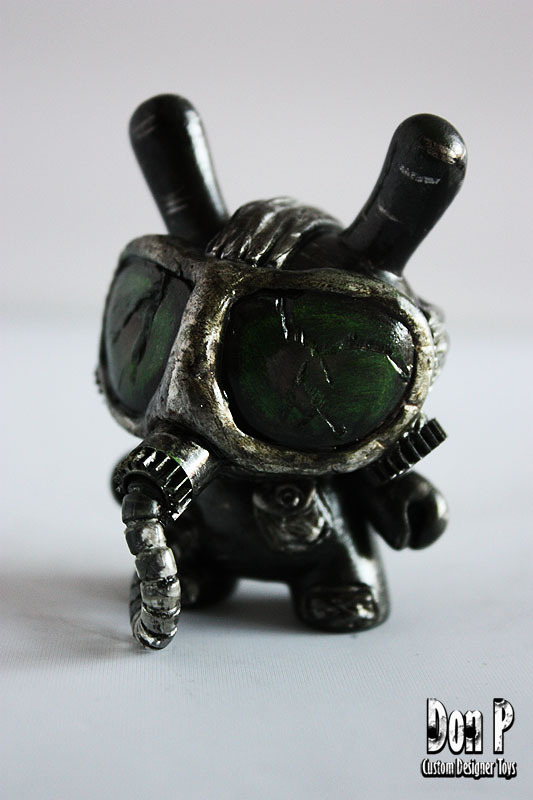 Don P sends us images of two commissioned 3" Dunnys he just completed: CyberNinja (above) and Apocaghast (below), both are made in his signature Apocalypse-style. 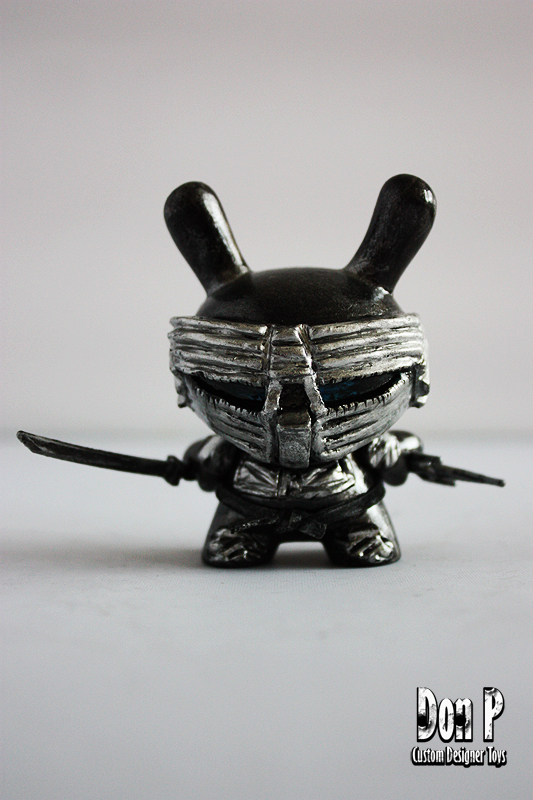 Rsin's custom Munny, which I believe he named Blaaaaaaah! 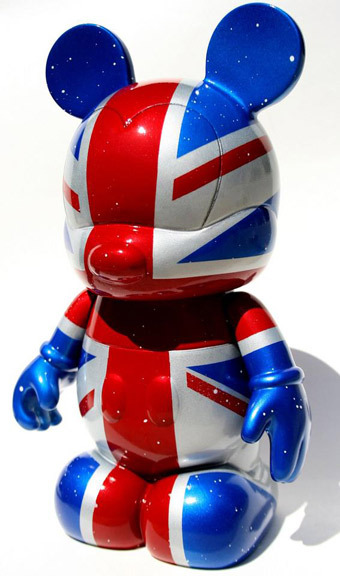 Evilos' Union Jack Vinylmation, which I think is the only Vinylmation in this show. Represent! 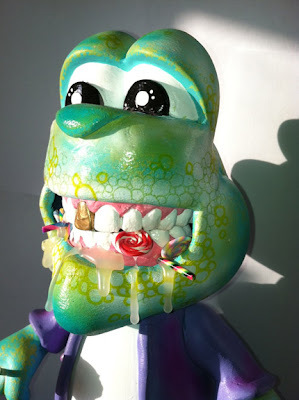 Sweet Teuth original resin sculpt by Brian Ahlbeck. The first of 5 in a series. 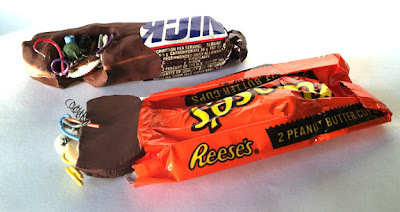 Real candy inside! 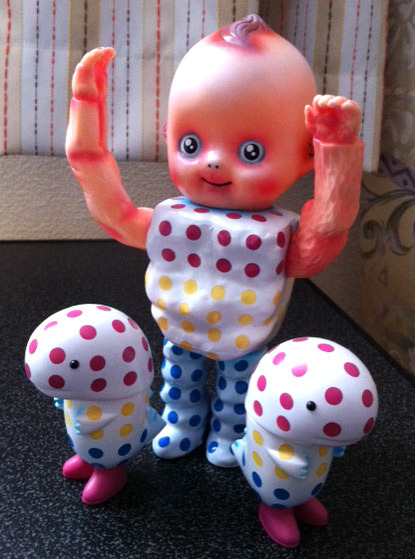 Jon Malmstedt of Rampage toys sent these 3 pieces from Japan, which will be sold separately. JonPaul Kaiser was a saint and whipped up this 4" Munny after I inadvertently left him off my email list when I sent all the vital info to the artists. I will always admit when I do something stupid; such was the case here. Thanks JPK! 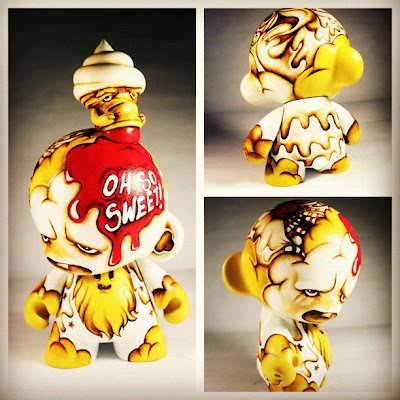 JC Rivera's Oh So Sweet Munny custom. 2 pieces, sold as a set. 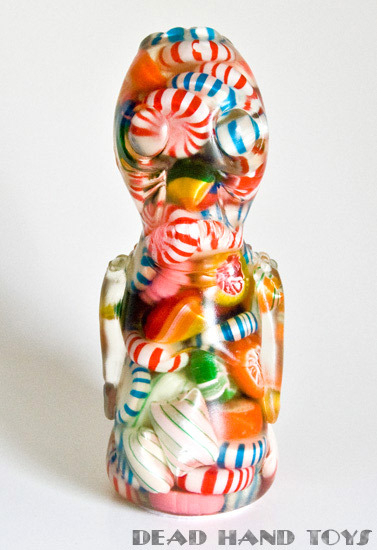 Sucklord sent us these wired up resin chocolates titled Robot Candy. 2 pieces; sold separately. Teru Fujita's Bentie the Bentley 7" Munny custom. Wired up with retractable hood ornament and working headlights. Shawn Wigs' Yoshi custom set; this includes 2 Dunnys and accessories. Full reveal in our online preview. Afterparty down the street at ABV (97th & Lex). The London Candy Company serves coffee, tea and hot chocolate at their bar, in addition to selling a giant selection of British candies. ABV serves beer, wine and food, but try not to sit next to Eric of Argonaut Resins as he will probably steal your appetizers. Last year we were both surpised and honored to have been nominated by one of our loyal customers in the Best Online Store category at the 2011 Designer Toy Awards. We were even more blessed to have made it into the final round- the "short list"- from which the winner was picked. Although we did not actually win, the nomination itself served as proof, for me personally, that I am on the right track with Tenacious Toys. 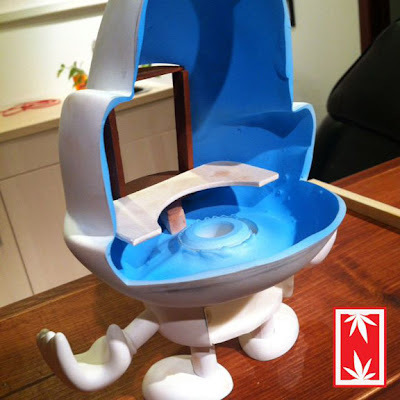 We've been doing our best over the past 7 years to create a fun and functional website where you can purchase your designer toys. We've also been heavily involved in the art toy community, cultivating artists and collaborating with talented people and interesting companies in order to provide collectors and fans with a more rewarding collecting experience. This year we have made a few changes to the process. 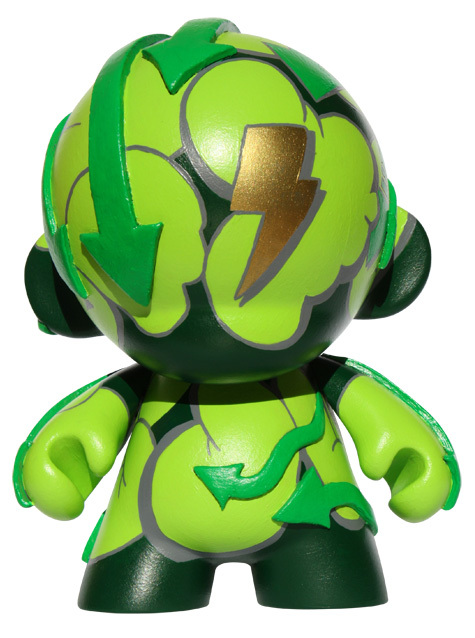 Firstly we removed two categories, "Most Influential Event" and "Best Functional Toy", from the line up to make the awards more concise. Secondly we have put together groups of nominating committees. These committees will be in charge of digesting the entries and discerning there qualification in the awards. The committees will reduce the entries to five nominees in each category for Board-voted awards and ten nominees in each category for Community Choice voted awards. 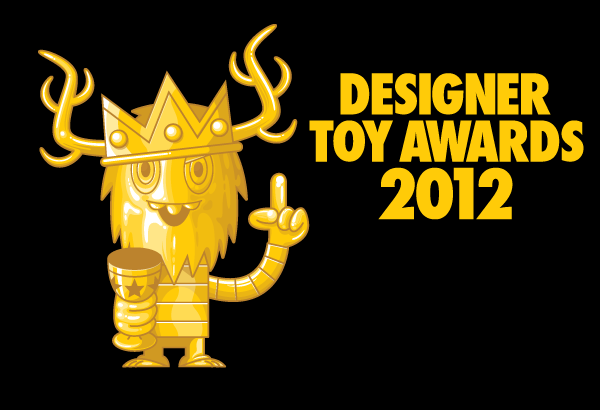 Nominations will be announced on the Designer Toy Awards Nominating Party, which will take place in San Diego during SDCC week. Be there to hear who the nominees are!! We'll announce them live before we post to the site. We'll turn community and board voting on shortly after SDCC. The other big news it that this year's award ceremony will be taking place in our home town of NYC during NYCC in October! WOOT WOOT!!. We hope as many of you as possible can be there, and we are looking forward to sharing more information with you as the year unfolds. It looks like when you go to the nomination page, you must log in to their site to make your nominations and cast your votes. If you voted last year, you already have an account. Once you're logged in, click on the Call For Entries button in the pink nav menu. If you have enjoyed the service and support that Tenacious Toys has provided during 2011, please consider nominating us or voting for us. We appreciate all of your feedback! Lining the gates of the palace is the illustrious Royal Guard of the Azteca Empire. Cast in solid gold, adorned with rare jewels and crystals, and proudly displaying the royal flag. Brought to you by two artist powerhouses Huck Gee and The Beast Brothers in a unique collaboration. 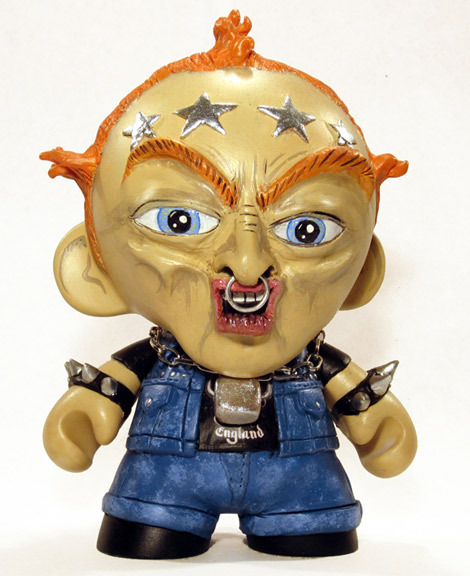 This 8-inch hand crafted custom will go on sale for only 24 hours starting Saturday, April 20 at 1pm EST only in The Beast Brothers Webstore. 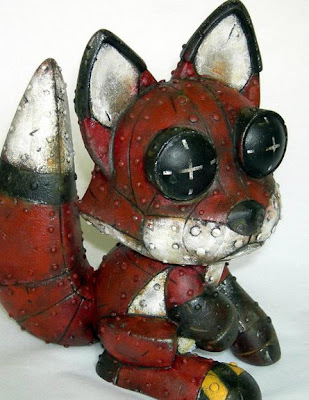 Each hand painted sculpture comes signed by each artist, adorned with purple Swarovski crystals, a custom flag, and safely entombed in a laser engraved wooden crate. 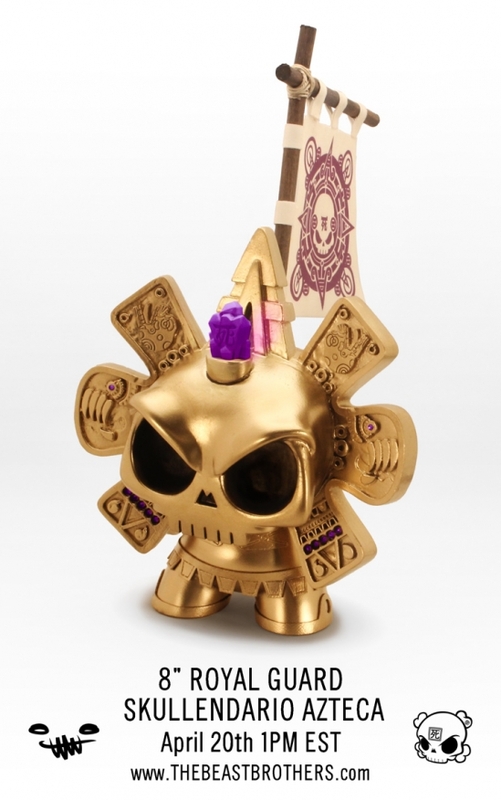 Each Royal Guard Skullendario Azteca will cost $475 plus shipping. 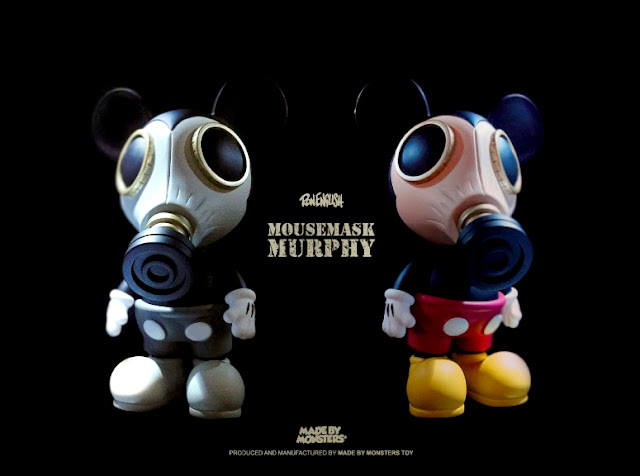 Ron English 10" Mouse Mask Murphys coming end April or early May. Price will be $140 + shipping. Original or grayscale available. HIT ME NOW if you want one- this is my ordering opportunity, right now, so please let me know. A non-refundable $40 deposit will be required to secure your order. Will be invoiced via Paypal immediately upon hearing from you. 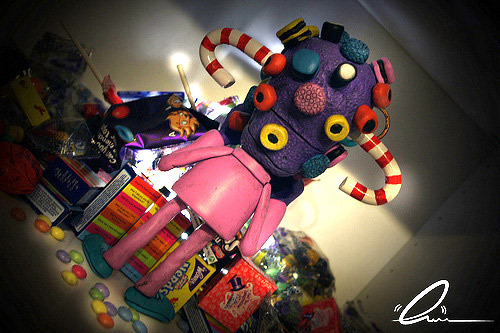 Zukie Emotion head charms (above) are made of sculpey and hand painted with detail. You can put one on your key chain, phone. Only 13 made! Click here to buy for $8 +shipping. Tiny Zukies (above) are back!!! Tiny Zukies are made of sculpey and each is 3/4 of an inch tall, with only 5 sets made. Each set comes with 4 Tiny Zukies. And they were available here for $8 + shipping, but they sold out in the past day or 2. 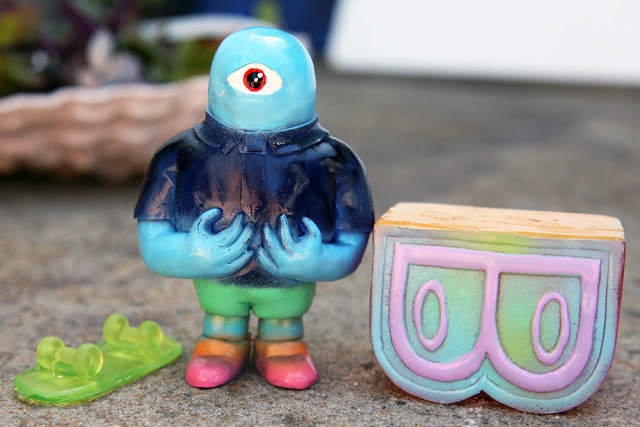 Tiny Zukie Charms are made of sculpey airbrush and hand painted. You can put them on your phone and keys- carry your ZUKIE everywhere! Each Tiny Zukie Charm is $6 + shipping and can be purchased here. Last year Fuller did a dunny custom which he called "Grr" (above). 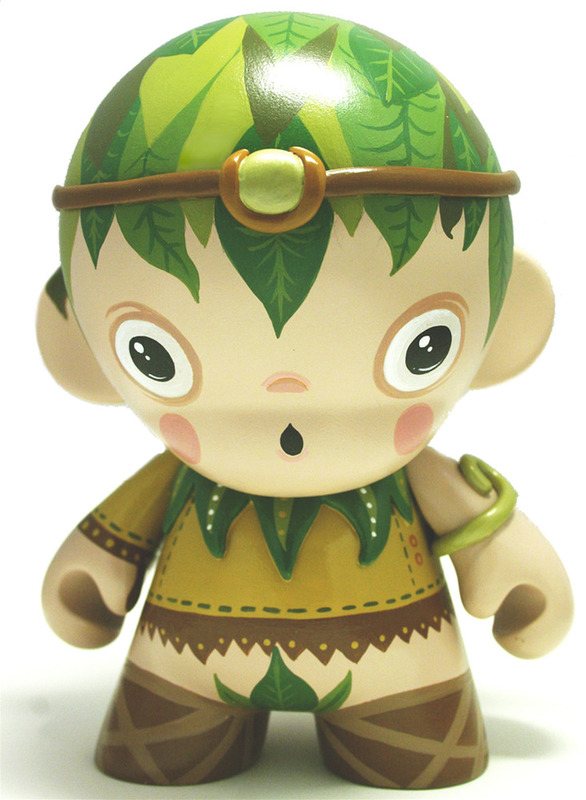 Fuller says: "The story behind Grrr is he is a little monster that lives in the forest. He doesn't want to be a monster so he dresses up like a tiger and runs around growling and scaring the little forest animals. I still love Grrr and I wanted to dedicate my next board to that character. I will be doing a whole campaign revolving around this character. I have T-shirts, pins and even a plush in the works for him. I hope you will like it." Fuller's Grrr deck is available for preorder in his shop here. They'll be shipping in May, and he's only making 10. They'll all be signed and numbered. This looks like a sweet deck, and one that I'd proudly hang on my wall. (I ride too messy to even consider bolting trucks to something like this) Personally I'm very excited for the Grr t-shirts and plushes he has in the works. Stay tuned for more info on those! 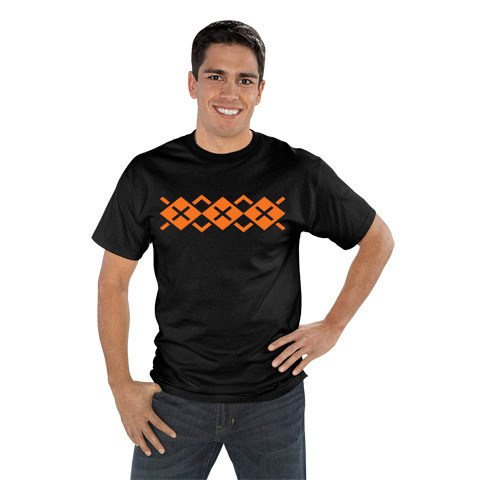 Now you can sport your allegiance to the Argyle Association right on your shirt! We are working with local screen printer Rebelution Ink to create these awesome Argyle graphic t-shirts (check their Tumblr and Facebook). Scott Tolleson provided us with a beautiful argyle graphic which will be printed in orange ink on black cotton t-shirts. All sizes available, from Small up to XXL. (Men's and Women's sizes from Small to XL are $20, XXL shirts are $23). We have added MANY new pledge levels to accommodate those of you who are interested in these shirts: for as little as a $20 pledge, you can get one of these shirts in your choice of sizes. We have also added additional higher pledge levels for those of you who might want to upgrade your current pledge by $20 to get a t-shirt in addition to what you've already pledged. Please click the link below to go to our Kickstarter page and see the many new reward levels available!